It’s one of the most iconic images in film history: the man with the horn-rimmed glasses and the straw hat clinging to one hand of a clock on the side of a building high above the street. It’s a picture so famous that it has floated free of its original context. It is recognized by people who have no idea who the man is or what he’s doing up there. The film is 1923’s Safety Last!. 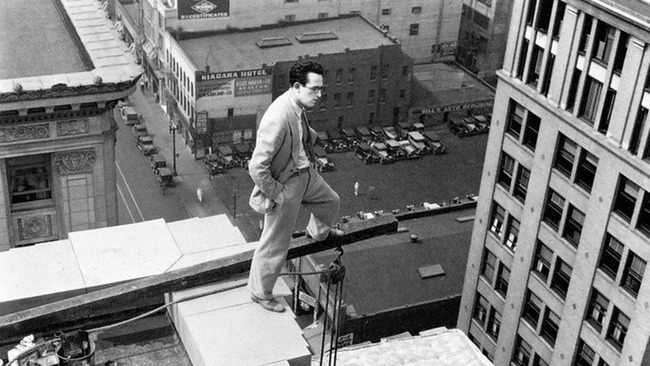 The man is Harold Lloyd, and what he’s doing, besides holding on for dear life, is changing film comedy forever. In the anything-goes world of early silent comedy, audiences had become accustomed to laughing at people in danger, but Lloyd had discovered that if he created a character just like the audience that watched him, they would not only laugh at him when he was in peril, they would fear for him. The combination of these two reactions resulted in a new genre: the “thrill comedy”—a form that Lloyd almost single-handedly invented. Safety Last! was only the fourth film he made in this style, but it was the first feature-length one, and it was wildly popular. 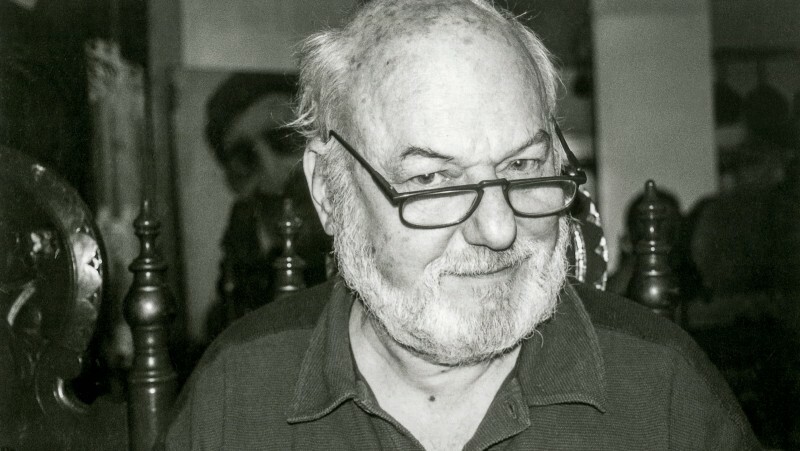 Not only did it cement Lloyd’s image in the public imagination forever, it became a major influence on comic artists of his time and the future. It all began in 1914, when Lloyd got into the movie business. Audiences who went to see comedy shorts in the early teens visited a realm of barely controlled chaos. The stars of those slapstick films were outsized figures, heavily made up and costumed, who featured in plots just sketched out enough to trigger frantic action and outrageous sight gags. They ran, fought, jumped, and kicked, but, perhaps most frequently, they fell. They fell out of windows; from speeding cars; off of ledges, cliffs, and docks; down stairs, wells, and manholes; into lakes, ponds, and oceans; and sometimes just onto the ground. There were no real-life consequences for any of these tumbles, no matter how spectacular. The comics would simply rise to fall again. The public that encountered young Harold at this time wouldn’t have seen a hairline’s difference between him and the average movie clown. He began his career as Lonesome Luke—a Tramp-a-like whose sole distinguishing feature was that his costume was too small, whereas Charlie Chaplin’s was too large. Not content to be a copycat for long, however, Lloyd created the “Glasses Character,” who was, in his words, “quiet, normal, boyish, clean, sympathetic, not impossible to romance.” This was something new. 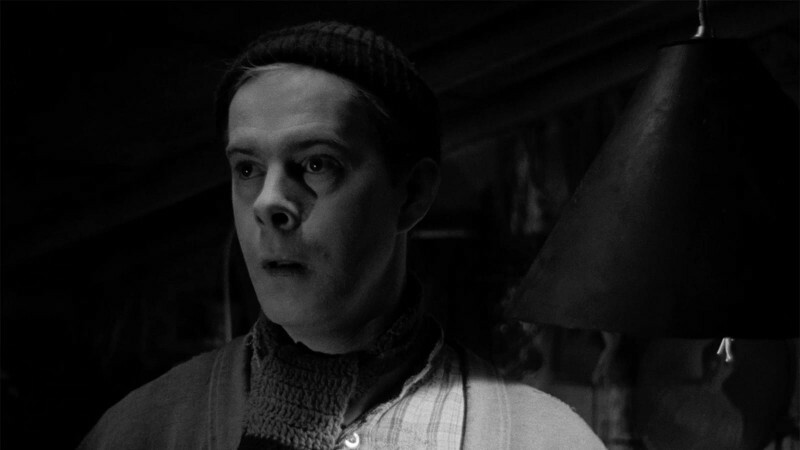 Audiences could connect emotionally to Chaplin’s Tramp, but Harold was someone they might pass on the street, someone they could actually be. Lloyd developed the new character over the course of a staggering eighty-one one-reel shorts and eighteen two- and three-reel shorts, beginning in 1917 and ending when he moved into features in 1921. To watch the surviving shorts in sequence is like looking into a novelist’s unedited notebook. We can see Lloyd experiment—holding on to what works and discarding the rest. At first, he keeps one foot solidly planted in traditional slapstick. He looks a lot more normal than Luke did, but he behaves with near equivalent raucousness. In the midst of so many movies and so much action, did something stand out for Lloyd about the experience of making 1919’s Look Out Below? In that film, Harold and Bebe Daniels sit on a girder in front of a building site and are so engaged with each other that they don’t notice the girder being lifted into the air. After transferring to some beams high above the ground, Harold and comic Snub Pollard carry on a fight much as if they were safely on the pavement below. It would be two more years before Harold would again find himself aloft, and by then much had changed. As Lloyd moved into two-, three-, and four-reel comedies, the last vestiges of caricature fell away. The average young man he played could no longer simply launch himself into outrageous situations. He had to get there by logical steps. In a 1920 short, the inebriated doctor Harold, in an attempt to save his sleepwalking patient Mildred Davis, follows her out onto a building ledge. 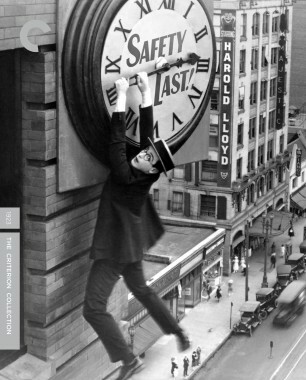 When she walks back in and closes the window, there he is: Harold Lloyd, in danger, high above the street. The scene that follows is short—roughly three minutes of a twenty-five-minute film—but hilarious. I suspect that Lloyd, who had used test screenings since his one-reeler days, saw what he had when watching the scene with one of those early audiences and gave the film its name after it was finished. That title was High and Dizzy, and for comedy buffs and historians, it has become a shorthand reference for all thrill comedies. Lloyd’s next climb into the sky came in 1923, when he created his first high and dizzy feature, Safety Last!. He made the film backward, shooting its famous climactic building climbing sequence first, then building the scenario that would take the audience, step by step, from a rational world into that insane situation. Lloyd’s unique approach paid off: Safety Last! 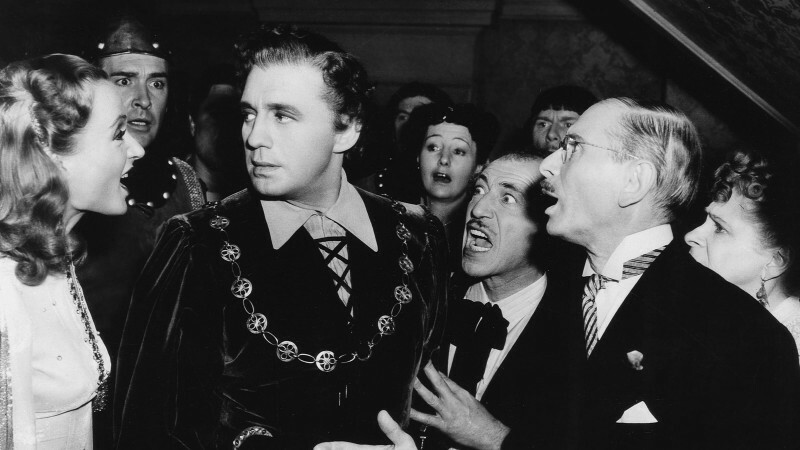 was Lloyd’s greatest success to date, bringing in over a million and a half dollars, and it came to define the thrill comedy as we know it today. Never happy to repeat himself, Lloyd would not return to the side of a building until the dawn of sound and the 1930 feature Feet First. The sequence is not as well motivated as the one in Safety Last!, and the addition of sound makes it all almost too real for comfort, yet Lloyd prized it enough to conclude his 1962 compilation feature Harold Lloyd’s World of Comedy with it, and in front of receptive audiences it worked very well. Although Lloyd moved on to other types of comedy, he had staked out new territory with the success of Safety Last!, and that did not go unnoticed. Many comics would make their own attempts to blend laughs and danger. These sequences vary widely in quality, but most of them, and certainly the best of them, follow the Harold Lloyd premise that more plausibility leads to more laughter. Even Chaplin, the great pioneer of character-based comedy, seemed to be looking over his shoulder at the man with the glasses. In his 1928 film The Circus, the Tramp is sent out to do a high-wire act. Chaplin, perhaps assuming that the audience would not be surprised to find out that he could actually achieve this feat, throws a literal barrel of monkeys into the sequence. One of the most directly Lloyd-esque set pieces in silent comedy appears in Laurel and Hardy’s 1928 short Liberty. Here the boys find themselves crossing girders on a building site in a scene that’s almost a remake of Never Weaken. Very funny on its own terms, the difference comes from the comedians’ respective characters. If Lloyd reminds us of us, Stan and Ollie are just a bit lower. We watch them thinking that we would never get into such a fix, and if we did, we’d probably make a better show of it than they do. In the sound era, the high and dizzy thrill scene became a staple of the sight-gag comedy features. Harry Langdon goes up in the air again in 1930’s See America Thirst, this time clinging to the roof of a skyscraper with Slim Summerville. Trying to get out of a stalled elevator in Whistling in Brooklyn (1943,) Red Skelton and three costars find themselves stuck on a cable dangling over the elevator shaft. Lou Costello hangs on to the ledge of a burning building in the 1943 Abbott and Costello film Hit the Ice, and tries to nap in a hammock slung between two buildings in 1947’s Buck Privates Come Home. In 1963, director Stanley Kramer released his massive attempt at the ultimate slapstick comedy, It’s a Mad Mad Mad Mad World. After nearly three hours of wild gags and action, Kramer ended his film with a deep bow to Harold Lloyd, placing his large collection of clowns on a rickety fire escape breaking free of a tall, derelict building. In later years, Harold Lloyd began to resent his fame as a thrill comedian, pointing out that only five of his many films fit that description. He was right, of course. His talent was much wider than that, and many of his other films are as good as those. But we don’t choose how history remembers us. Once upon a time, a man with horn-rimmed glasses clung to a clock in the sky, and no one who saw it ever forgot it.